I did get slightly bored of writing these types of posts last year, however as summer will shortly be upon us! I thought I'd start doing them again as there are bound to be some good freebies! So for May's June Issues I've found two pretty good offers - both in Marie Claire & Instyle and both on sale from May 5th! 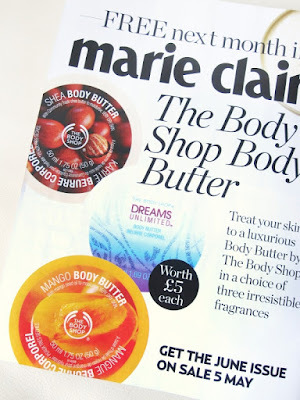 The first offer is the one you can see above which will be found with Marie Claire - there is a choice of 3 Body Shop Body Butters but as you can see they are only 50ml each so they are in fact the smaller versions and not full sized. 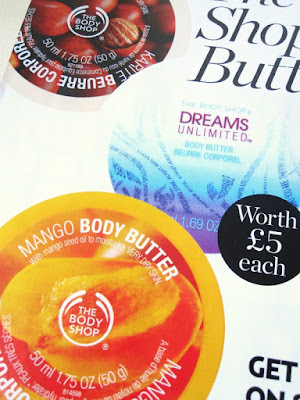 Though the Shea Body Butter & Mango are my favourites especially for summer. The next offer I sadly couldn't get a picture of as I didn't have this month's Instyle to hand. But the freebie is pretty good with the return of the free Nails Inc polishes! Again there's a choice of 3 full-sized Nail Inc polishes - Candy Orange, Electric Teal and Fashion Fawn (all worth £11 each). To be honest I do love how Nails Inc are teaming up with so many different brands to give away free polishes but the shade range is getting abit of the boring side and these definitely remind me of the last Boots offer shades. Having said that I won't be looking a gift horse in the mouth and shall be snaffling up Candy Orange and Fashion Fawn. I have to say Fawn has never been fashionable though!